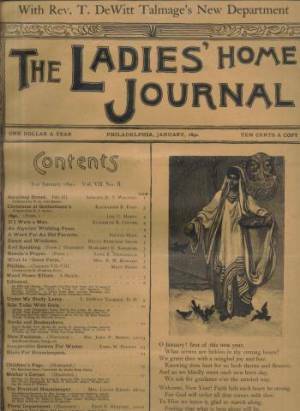 This page examines the early history of the Ladies Home Journal by looking directly inside several issues from the publication’s first decade in existence. I was lucky enough to acquire several of these issues from the important transitional period of the 1880’s into 1890. Several of these issues are detailed below with additional comments when necessary. I will likely post a more conventional history of Ladies Home Journal on this site sometime in the future, but this page is intended to illustrate the subtle changes during the period Louisa Knapp Curtis handed off the editorial reins to legendary publishing figure Edward W. Bok. Newspaper publisher Cyrus Curtis included a column for women in the “Tribune and Farmer” which he had started in 1879. His wife, Louisa Knapp Curtis did not think his women’s column was very good, and so she took it over and made it popular enough to expand first to a full-page and eventually to a monthly supplement. This supplement became the Ladies Home Journal and Practical Housekeeper, which had its first issue December 1883. When his wife no longer had the time to work the Journal, Curtis hired Edward Bok as his new editor in October 1889. Bok would become a legendary figure in publishing through his work at the Journal. Curtis would revolutionize both advertising and circulation techniques in the Journal and later use similar methods to take his other magazine, the Saturday Evening Post, to even greater heights. That’s the simple history, though details below will include Mrs. Curtis’ exact stated reasons for departing along with Edward W. Bok’s message to readers when he took over as Editor of Ladies Home Journal. Note above the October 1889 date marking Bok’s hiring by Curtis, and while this may be true the first issue to actually sport Bok’s name at the top of the masthead is January 1890. March 1886, Vol. III, No. 4. 16-pages as edited by Mrs. Louisa Knapp. 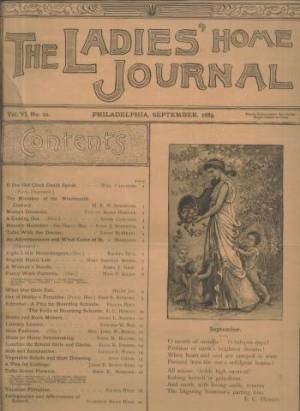 The beginning of the issue contains fiction and/or articles credited to Mrs. Emma C. Hewitt and by Mary Abbott Rand. NOTE: Contents vary very little over the next several issues, a few of which I have left off this page because they add nothing to it. Printed on newsprint and measuring approximately 11″ x 16″, these early issues were probably hard on the eyes as they consist of several long columns of text with small graphics interspersed every so often. Advertising featured mostly floral and beauty products with a few exceptions. Note that the editor does not use her husband’s last name in her byline. February 1887, Vol. IV, No. 3. 20-pages as edited by Mrs. Louisa Knapp. The issue opens with “Josiah Allen at Saratoga” by Josiah Allen’s Wife. Note: This issue is four-pages longer than previous issues and I believe it is because it is the first of several (first in the batch I have at least) to begin offering premiums to subscribers for securing new subscribers. This is a circulation gimmick which must have worked well for Curtis, as most of the issues below will include some sort of Premium offering culminating with a 40-page Premium Supplement in our final issue. It is largely Cyrus Curtis’ innovations regarding advertising which makes these early Ladies Home Journal issues important. Curtis realized that you could charge more for advertising based on qualified circulation and so any attempts at increasing circulation are an attempt to make more money from advertising. According to Tebbel and Zuckerman in “The Magazine in America: 1741-1990” 1887 was the year Curtis announced that he was going after a million subscribers (95). September 1887, Vol. IV, No. 10. 16-pages as edited by Mrs. Louisa Knapp. NOTE: The Louisa May Alcott story is probably the most important piece of fiction published in any of these early Journal issues. Tebbel and Zuckerman note that Cyrus Curtis solicited this piece by promising to donate $100 to Alcott’s favorite charity (94). Notice from Cyrus Curtis on the Editorial Page is headlined “A Million Subscribers” where Curtis brags about his advertising, makes mention of his premium giveaways and then proposes a contest to readers awarding $200 in cash to the person who sends him the greatest number of trial subscribers by October 15. Furthermore he offers $150 the second place finisher downt to $25 for the sixth largest list. March 1888, Vol. V, No. 4. 20-pages as edited by Mrs. Louisa Knapp. March 1889, Vol. VI, No. 4. 24-pages as edited by Mrs. Louisa Knapp. September 1889, Vol. VI, No. 10. 24-pages plus outer covers as edited by Mrs. Louisa Knapp. NOTE: Changes occur with this issue. There are separately numbered outer covers (I-IV) of a slightly heavier stock protecting the more fragile inside pages. Complete contents are listed on the outside cover and so they appear below as well. 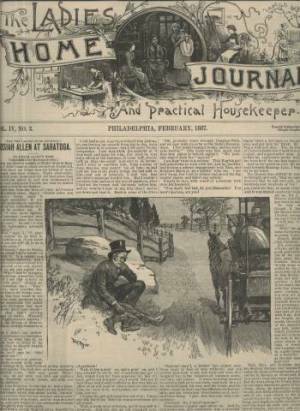 While “The Practical Housekeeper” will appear in later issues as a column (By Louisa Knapp), it has been removed from the title of the magazine. While Knapp is still listed as editor of this issue this is the first that I have that does include writing by Edward W. Bok. October 1889, Vol. VI, No. 11. 24-pages plus outer covers as edited by Mrs. Louisa Knapp. November 1889, Vol. VI, No. 12. 24-pages plus 16-page Premium Supplement plus outer covers, totaling 44 pages. Edited by Mrs. Louisa Knapp. 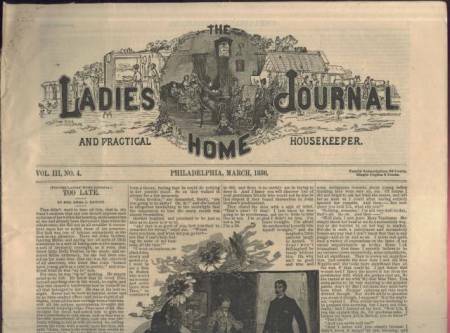 NOTE: An announcement in the Editorial section states — “For this month we print one million copies of the Ladies’ Home Journal, a circulation larger than ever before attained by any periodical in this world. Of course we do not claim this as a regular, permanent circulation, although, we hope, the time is not far distant when we may have fully that number of paid subscribers. With the November issue we mail copies of the “new” Journal to several hundred thousand “old” subscribers, who have failed to renew during the past two years.” I assume by “new” Curtis is referring to the format changes mentioned above taking place with the September 1889 issue. December 1889, Vol. VII, No. 1. 25-pages plus 16-page Premium Supplement plus outer covers, totaling 45 pages. Edited by Mrs. Louisa Knapp. This is the final issue with Mrs. Louisa Knapp listed as Editor, Bok will take over that honor in the January issue next month. January 1890, Vol. VII, No. 2. 24-pages plus outer covers. This is the first issue edited by Edward W. Bok beginning his long history with Curtis Publications and the Ladies Home Journal audience. Editorial: Including An Editorial Change. See Below. The Practical Housekeeper by Mrs. Louisa Knapp which opens with an annoucement about her stepping down, see below. “The retirement of Mrs. Knapp is rendered necessary by increasing domestic duties, incompatible with the editorial demands of a growing publication. While her direct editorial connection with be severed, her hearty interest and sympathy in all that appertains to the success of the Journal remains undimmed. February 1890, Vol. VII, No. 3. 28-pages plus outer covers. This is just the second issue edited by Edward W. Bok. March 1890, Vol. VII, No. 4. 32-pages plus outer covers. Edited by Edward W. Bok. May 1890, Vol. VII, No. 6. 28-pages plus outer covers. Edited by Edward W. Bok. June 1890, Vol. VII, No. 7. 30-pages plus outer covers, plus 40-page Premium Supplement section offering goods for attracting subscribers (some cool stuff, toy trains, magic lantern, lots of books). Edited by Edward W. Bok.